Zuckerberg said he’d “love to see” regulation on ad transparency. But that’s not the company’s message to lawmakers. Facebook CEO Mark Zuckerberg said yesterday that the company welcomes more regulation, particularly to bring transparency to political advertising online. But in recent months, Facebook has been quietly fighting lawmakers to keep them from passing an act that does exactly that, campaign transparency advocates and Congressional staff tell Quartz. The Honest Ads Act was introduced last October to close a loophole that has existed since politicians started advertising on the internet, and was expected by many to sail through Congress. Coming as Congress investigated how Russia used tech companies to influence the 2016 election, it was considered by many in Washington DC to be the bare minimum lawmakers could do to address the problem. The act introduces disclosure and disclaimer rules to online political advertising. Tech companies would have to keep copies of election ads, and make them available to the public. The ads would also have to contain disclaimers similar to those included in TV or print political ads, informing voters who paid for the ad, how much, and whom they targeted. “The benefit of having disclaimers on all political ads [is] the more suspicious ads would be more identifiable,” said Brendan Fischer, the director of federal and Federal Election Commission reform at the Campaign Legal Center (CLC) in Washington. In a vote of confidence from bitterly-divided Washington, the act was rolled out by a bipartisan group of senators—John McCain, the Republican from Arizona, and Democrats Amy Klobuchar from Minnesota and Mark Warner of Virginia—and it currently has the support of 18 senators. But it hasn’t moved from the committee on “Rules and Administration” since was first introduced, thanks in part to Facebook’s lobbying efforts. Lobbyists for the company have been trying to dissuade senators from moving the Honest Ads Act forward, some Congressional aides say. Facebook’s argument to Congress behind the scenes has been that they are “voluntarily complying” with most of what the Honest Ads Act asks, so why pass a law, said one Congressional staffer working on the bill. Facebook also doesn’t want to be responsible for maintaining the publicly accessible repository of political advertising, including funding information, that the act demands, the staffer said. Facebook spent nearly $3.1 million lobbying Congress and other US federal government agencies in the last quarter of 2017, on issues including the Honest Ads Act according to its latest federal disclosure form. It also signed on Blue Mountain Strategies, a lobbying firm founded by Warner’s former chief of staff, an Oct. 30, 2017 filing shows. 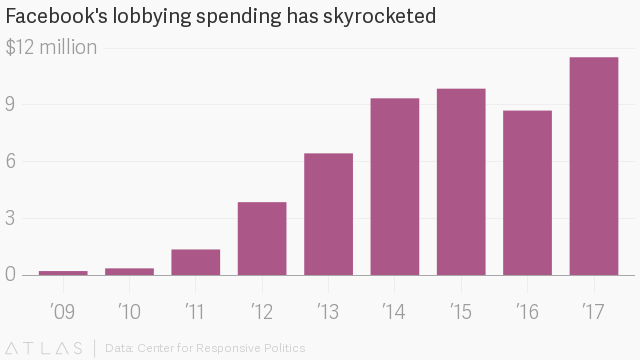 It’s part of a massive uptick in lobbying spending in recent years. Asked about the allegations of obstruction before Zuckerberg’s March 22 public appearance, a Facebook spokesman pointed Quartz to the company’s earnings call for the last quarter of 2017, in which Zuckerberg mentioned some of the ways Facebook has been proactive. “We support Congress passing legislation to make all advertising more transparent, but we’re not going to wait for them to act,” he said. Facebook working to pressure Congress not to pass laws is one example of the major hurdles lawmakers face in regulating big tech companies, industry and political experts say. “Highly successful tech companies strategically cultivated bipartisan support though lobbying and campaign finance, and a public perception of being benign,” said Raj Goyle, a former Kansas state legislator and ex-Congressional candidate, who now is the co-CEO of legal tech platform Bodhala. “What needs to happen is a very thorough investigation and a public airing of the way these platforms function,” he said. Facebook “doesn’t even know the power of its own platform,” he said. While the Congressional effort on Honest Ads has stalled, there’s been one regulatory action: a December ruling by the FEC that a political group must include disclaimers on its Facebook ads that call for the election or defeat of a candidate. But the decision is narrow, the regulators said, applying to only identical situations as the one they ruled on. The Federal Trade Commission is also investigating whether Facebook violated a 2011 consent decree by allowing a third party to harvest personal information without users’ knowledge.